BlackBerry seems to have built the Tour to a very high standard. Holding it, the handset is heavy enough that it doesn’t feel cheap and flimsy, but not so weighty that it feels like a brick. The screen quality is amazing, and looks crisp whether you’re typing out emails our watching YouTube videos. The Tour supposedly has one of the best call qualities of any BlackBerry, and I don’t doubt it – voices come through loud and clear. It’s also got one of the best keyboards of any smartphone. Coming from the Pearl meant relearning how to type on the full keyboard and doing without the SureType predictive software I had been using for almost two years, but the adjustment didn’t take long. Each key has a raised section and a scooped-out part, making it easy to feel where one key starts and the other ends. As far as I can tell, the GPS chip on the Tour is completely unlocked and usable by third party applications like Google Maps, Poynt, etc. I’m happy to see that Verizon has softened it’s grip here, because being limited to their costly VZ Navigator service is just not acceptable anymore. 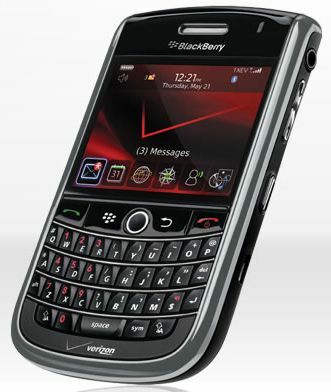 Besides the usual CDMA radio used for Verizon’s wireless network, the BlackBerry Tour also features a GSM radio that can be activated and used for out-of-country travel. I have no idea if I’ve ever have the opportunity to use this second radio, but it’s nice knowing it’s there if the needs arises. Having moved from the Pearl 8130 to the Tour, I’m quite used to the BlackBerry experience. Having said that, the move from BlackBerry OS 4.5.x to 4.7.x includes a few notable changes. The most obvious difference is the default theme. It’s simple, elegant, and hi-tech looking when compared to the stock Pearl interface. I also like the fact that you can now create folders to organize your applications, helping to minimize clutter on the main listing screen. Other changes include updated versions of the BlackBerry Messenger app and an improved web browser that, while not comparable to any WebKit-based browser, does a respectable job of rendering most websites. I’ve run into a few issues with the Tour so far. For at least a week, a few notable applications, including the Amazon app and the Google Mobile app, simply couldn’t be installed on it because I assume they weren’t included on their lists of compatible handsets. This is somewhat understandable since the Tour is a brand new phone, but it’s still annoying. The applications that didn’t work seem to have been updated in the last couple of days, however, so they’re now installing without any problems. Occasionally the system seems to become unresponsive for a few seconds while typing or clicking through menus. It sits frozen for a few seconds, and then suddenly starts working again. I haven’t yet been able to reproduce this problem in a reliable way. I’ve had some issues with scrolling left and right with the trackball on the main application screen. The cursor moves fine within the browser, however. Changing the trackball sensitivity fixes this problem for me. Those minor issues aside, I would absolutely recommend the BlackBerry Tour. It’s currently the best phone available for the Verizon network, and has one of the best phone keyboards, period. If you can get over the fact that a BlackBerry will never be an iPhone and embrace it, quirks and all, I think you’ll love it too. you neglect to mention that verizon has (yet again) crippled the bluetooth stack to near-uselessness. verizon hates its customers. The RIM BlackBerry® Tour supports the following Bluetooth profiles: Headset (HSP), Hands–free (HFP), Serial Port (SPP), Dial–up Networking (DUN), Advanced Audio Distribution (A2DP)and Audio/Visual Remote Control Profile (AVRCP). OBEX Profiles: PBAP. Looking at Verizon’s Bluetooth Functionality Chart (PDF), there are phones that offer all (Samsung Omnia) or almost all (HTC Touch Pro) available Bluetooth profiles. So, it seems to me that it’s RIM – not Verizon – that’s limiting Bluetooth capabilities on its phones (probably for security reasons).